Wiki Loves Monuments is an international photo contest for monuments, organized by Wikimedia this September. Wikimedia is the movement behind Wikipedia, the free encyclopedia – a global collaboration authored by volunteers. Cultural heritage is an important part of the knowledge Wikipedia collects and disseminates. Everybody can contribute images as well as write articles. An image is worth a thousand words, in every language at once and local enthusiasts can (re)discover the cultural, historical, or scientific significance of their neighbourhood. 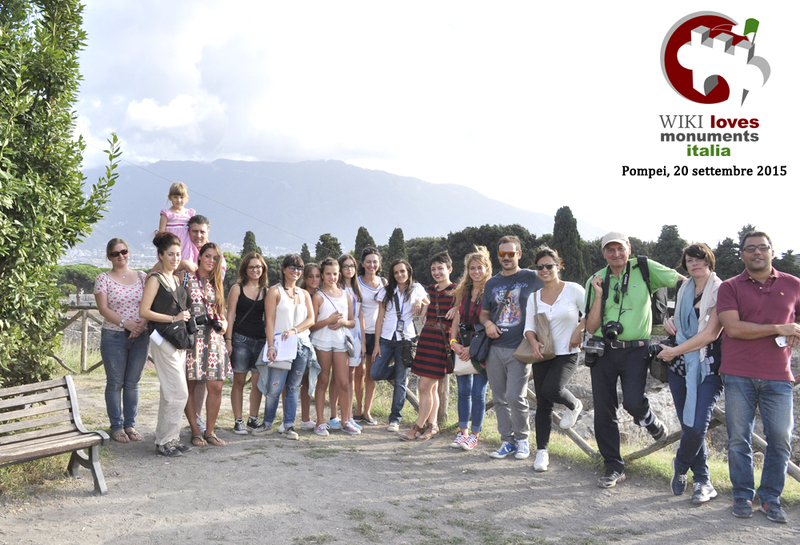 Felicia, one of the guides of our staff, was the official guide during the experience “Wiki loves monuments” in Pompeii. Book your tour with us! The mosaic represents an allegorical and symbolic philosophical theme of the transience of life and death that eliminates disparities in social class and wealth. The summit of the composition is a level with his plumb line, a tool that was used by masons to control the levelling in construction. The axis of the lead is the death (the skull), under a butterfly (the soul) balanced on a wheel (Fortune). Under the arms of the level, and opposed in perfect balance, are the symbols of poverty on the right (a stick a beggar and a cape), and wealth to the left (the sceptre a purple cloth and the ribbon). Popular belief says the phrase “Memento mori” originated in ancient Rome: as a Roman general was parading through the streets during a victory triumph, standing behind him was his slave, tasked with reminding the general that although at his peak today tomorrow he could fall or be brought down. The servant is thought to have conveyed this with the warning “Memento mori” that means “Remember that you will die”. This moseic have been also used for the cover of the Pink Floids’ album “Live at Pompeii” recorded in the Amphitheatre of the city in the year 1971. Book now your guide tour at the Archaeological Museum of Naples!